In every generation, dere is a Chosen One. She alone wel stan against de vampiahs, de demons, and de forces o dahkness. She is de Slaya. And now you know why they killed her off after only three episodes; the only thing more annoying than listening to that pseudo-Jamaican patois is trying to write it. Her death was more a service to the script writers than the storyline. Kendra was called as the Slayer after Buffy's death at the hands of the Master, but when Buffy was resuscitated there were suddenly two Slayers keeping watch at night. Eventually, however, Kendra gave her life trying to protect Buffy's friends from the insane Drusilla. This project was really just about the use of leftover parts; after crafting Vamp Willow, I used the remaining bits to make the second Slayer, Kendra. The most difficult part had to be creating her braids; I originally tried sculpting them from clay, but eventually decided that it would just be more expedient to bend a twisty tie into the appropriate shape. I also painted a bit more hair along her temples so she didn't look prematurely bald. A twist tie also served as those humongous hoop earrings. 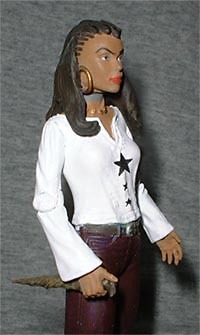 Kendra is 6" tall, and is articulated at the shoulders, elbows, hips and knees. 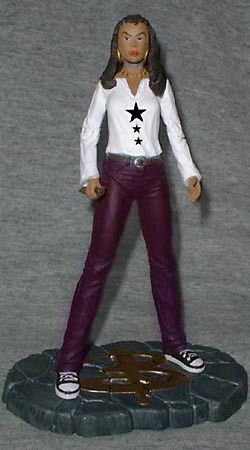 She even comes with Mr. Pointy, her lucky stake. Who's your favorite Slayer? Tell us on our message board, the Loafing Lounge.